Work trip report by Bill Miller. 1. 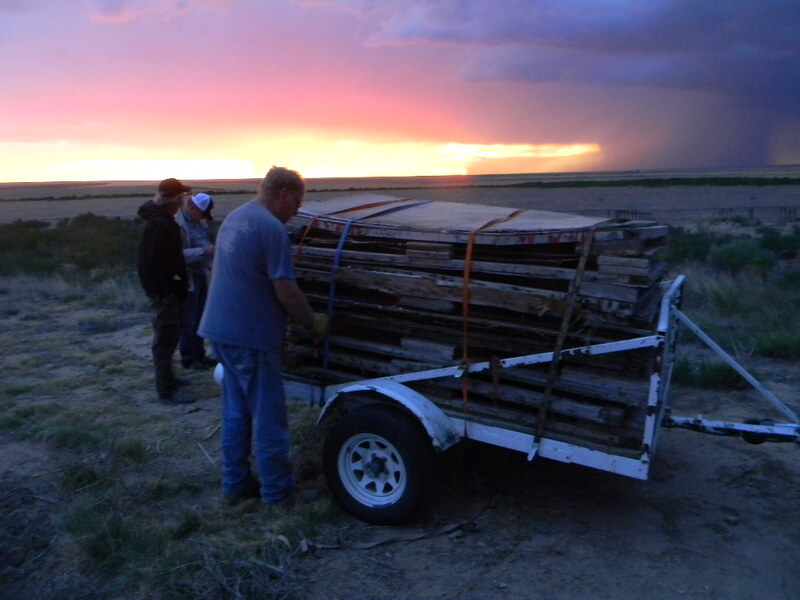 Steve, Ed, Bill, Dave, Michael, Steve and three women volunteers from Las Animas cleaned all of the scrap metal, wood and unused tech equipment out of the bunker, and loaded as scrap onto Ed’s trailer. 2. They also cleaned out the scrap from the pedestal and in front of the new outhouse. 3. Dave and Ed both took full trailer loads of scrap back to Colorado springs for salvage. 4. Rich brought his lawn tractor and mowed all the grass and weeds along the road and in the open space, AKA the Diane Uberecken Memorial Park area around the dish. 5. Dave and Bill unloaded about 700 lbs of concrete and sand that Dave brought into the bunker, for use on rebuilding the retaining wall. 6. Ed wired up the breaker panel in the outhouse and attached the RV outlet wires. 7. Steve installed the RV outlet pedestals by driving steel fence posts and attaching the outlets. 8. Dave cleaned out the bottom of the bunker ramp and worked on some of the retaining wall. 9. 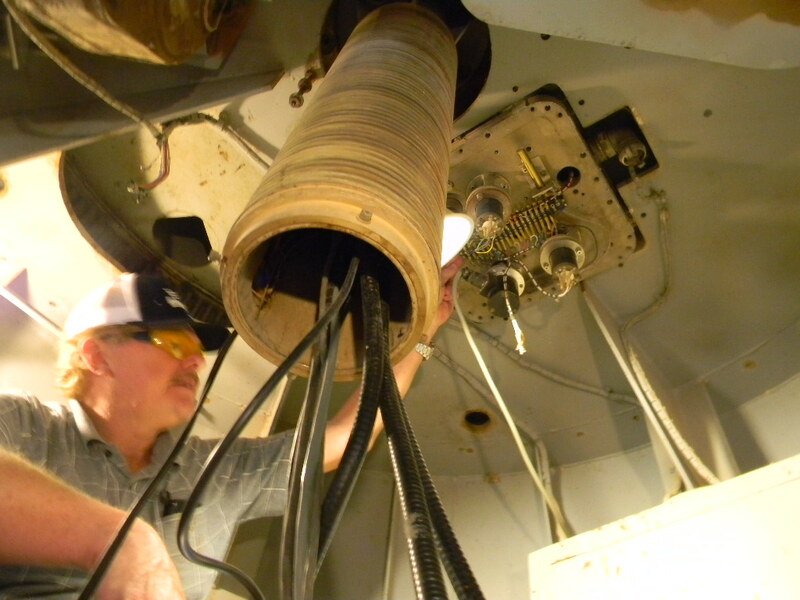 Bill measured and accessed the installation for the elevation synchro wires and liquid-tight conduit from the upper deck to the control deck of the pedestal. Trip report and photos by Gary Agranat and Bill Miller, with contributions from the rest of the team. 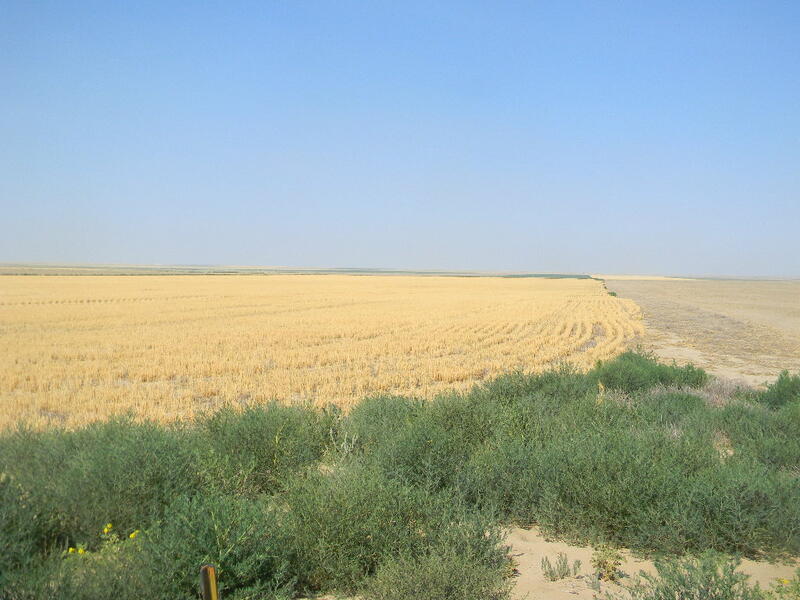 – The site received several days of heavy rains during the previous week. The bunker sump pumps were overwhelmed and the bunker was flooded. Steve and Paul spent a number of hours on Friday and Saturday morning clearing out the water and cleaning up. Steve reported clearing at least 60 gallons of water. Dave later on Saturday also spent time removing water and cleaning. Paul cleaned up some more water on Monday morning. – On Saturday morning Paul and Bill filled in the conduit trench for the synchros. 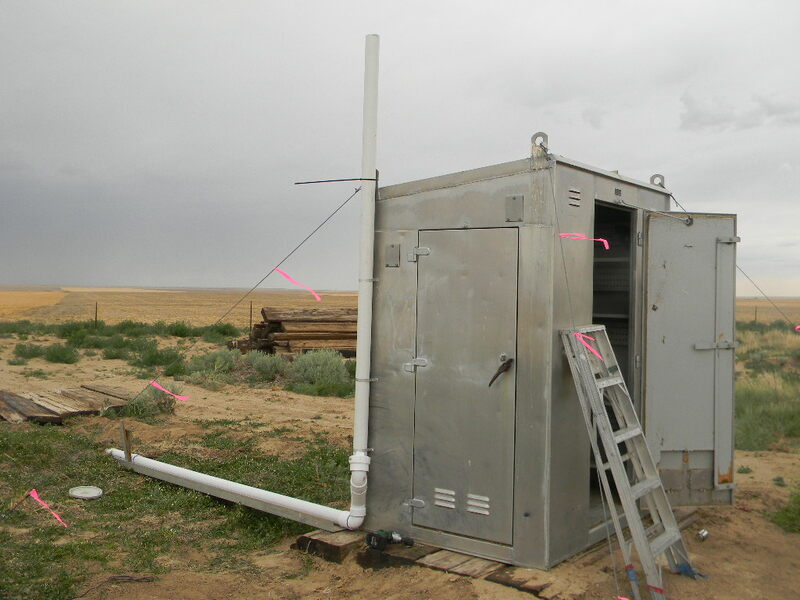 – Ed installed a conduit and the power cables from the pedestal to the outhouse. 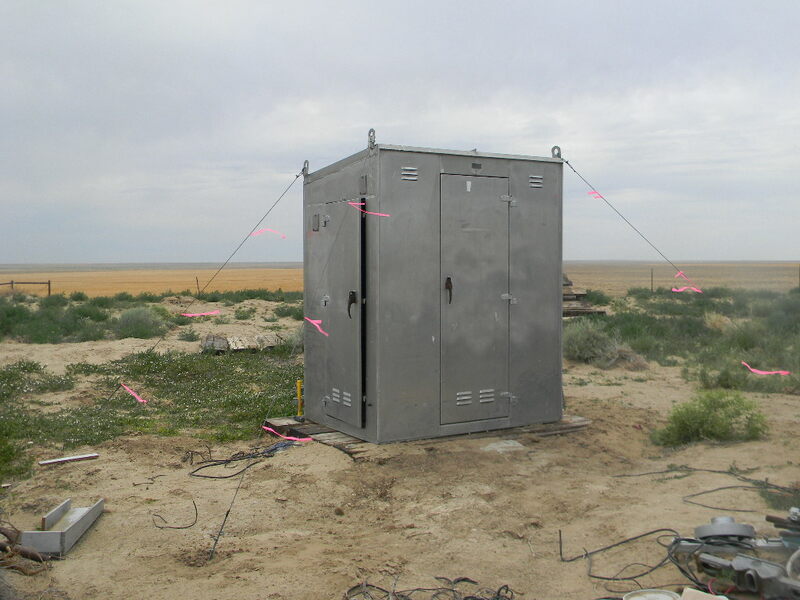 He also started to install the cables from the outhouse that will lead to the RV power risers and connections. Ed said he intends on the next site trip to put in breakers, extend the wires to the RV locations, and install the outlets there. 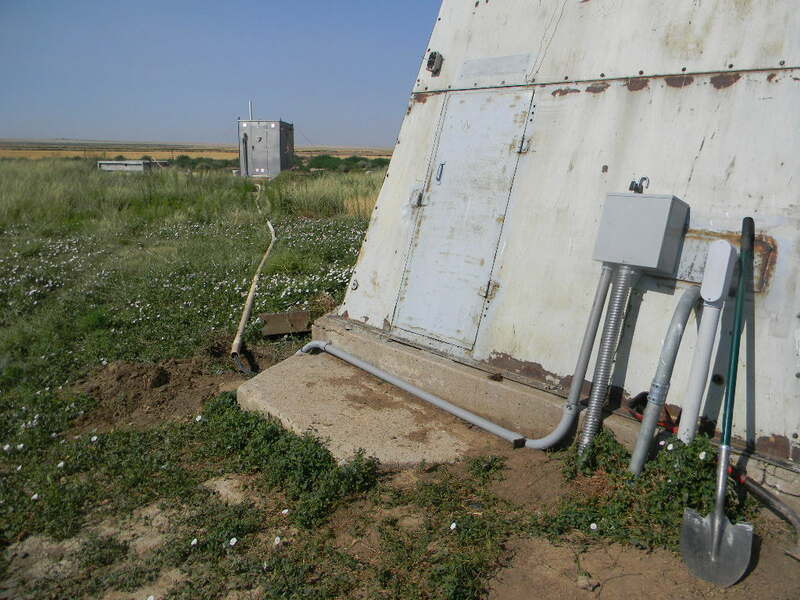 – Paul put in wiring to the limit switch system, for azimuth and elevation limits of the dish travel. Paul stayed over Sunday to complete more of this. – Paul and Bill installed the synchro indicator panel and reinstalled the manual dish steering control panel in the rack, in the com trailer. The panels in the rack will still need to be moved down one U space, to accommodate Skip’s TM-4 timing control. 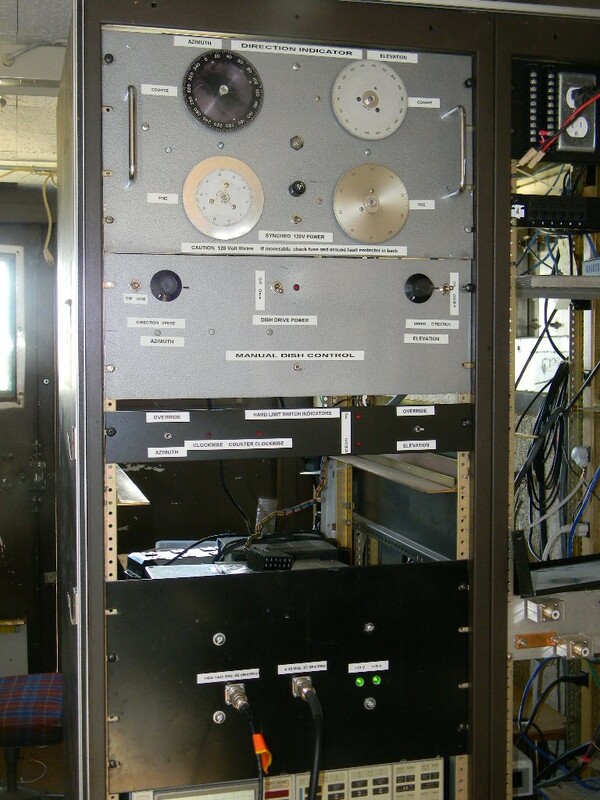 The Spectrum Analyzer was moved over to the adjacent rack. 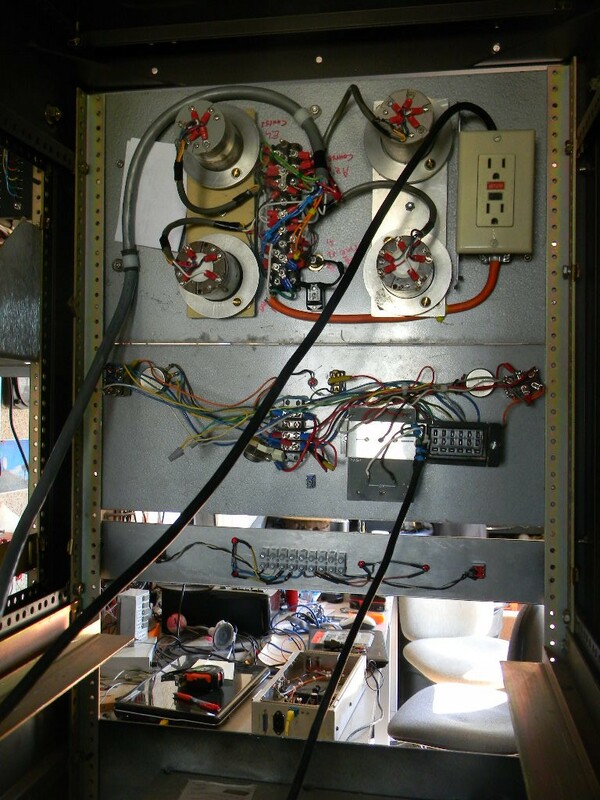 Paul installed the limit switch control panel under the manual control panel in the rack. They redid the panel configuration so that all the panel controls have azimuth on the left and elevation on the right to match convention. 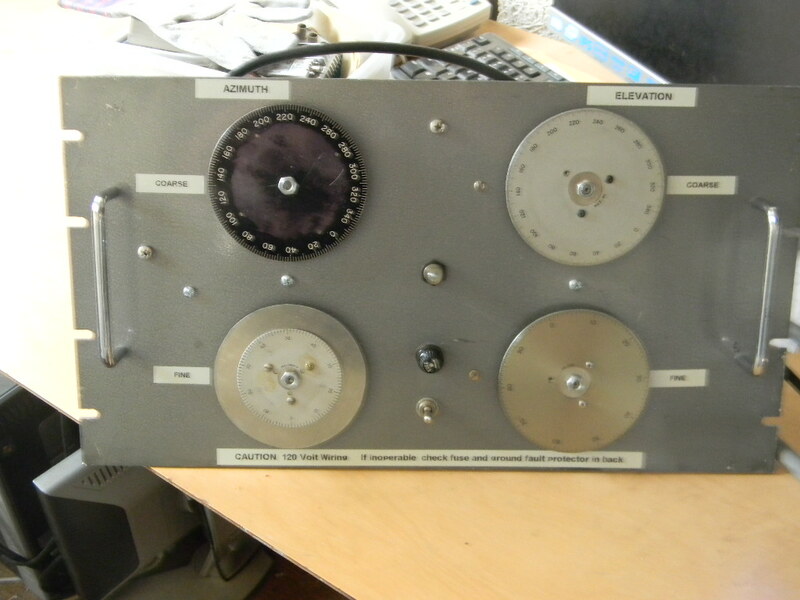 Bill relabeled all of the control panels to provide a more organized presentation of the switch and knob functions. – Bill brought out the System 2 dish controller and laptop. It had worked well on the bench at home, but at first didn’t work at the site. After some frustration he called Ed Johnson and they worked through the problem. The static IP address of the computer had to be set and then the system communicated and could be tested. Paul stayed in the tower control deck while Bill drove the dish from the comm. trailer. A fairly serious problem was found and Ed was consulted again by phone. The watch dog timer was apparently timing out and dropping the power to the motor drives about 3 times a second. Seeing this they immediately shut it down. Bill took the system home to do a modification on the VFD power enable relay and to trouble shoot the reason for the time out. Once fixed, he will bring it back for more testing. Bill informed Dave Molter of the problem and asked that he not repeat the same issue in the motor drive control circuits of System 1. Bill also provided Dave with a linear power supply and some parts to complete System 1 controller. 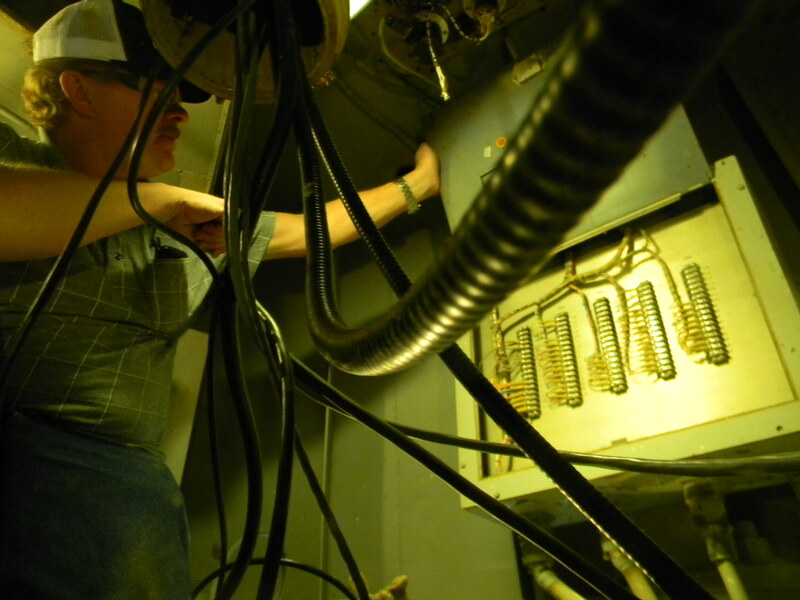 – Bill also installed the latch on the System 2 Controller and temporarily installed the DB25 switch boxes in the control deck so we can switch between systems for test and maintenance. 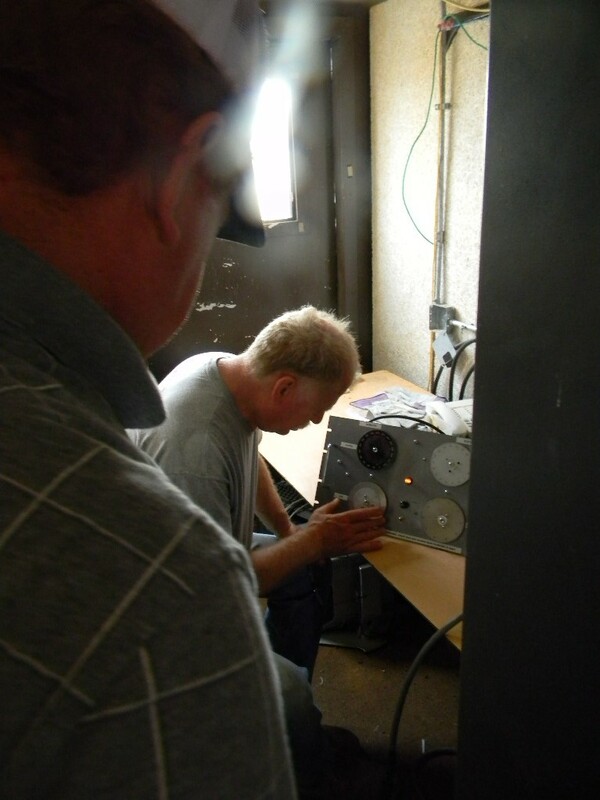 – Steve and Gary worked on installing the MFJ auto-tuner for the FT-897 ham transceiver in the bunker. They found that the tuner would not power up, although the manual indicated that it should have. There is an alternative way to directly power the tuner, but they didn’t have the proper wiring. Steve gave Gary a wire on Monday, which can be used to connect the tuner directly to the power supply (located lower on the bench below the rigs). 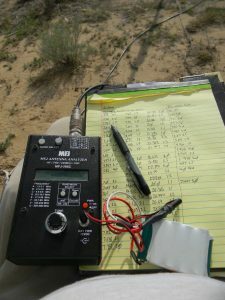 Gary also brought the mini-manual for the FT-897. It is like a checklist, and is useful for quickly finding menu settings. 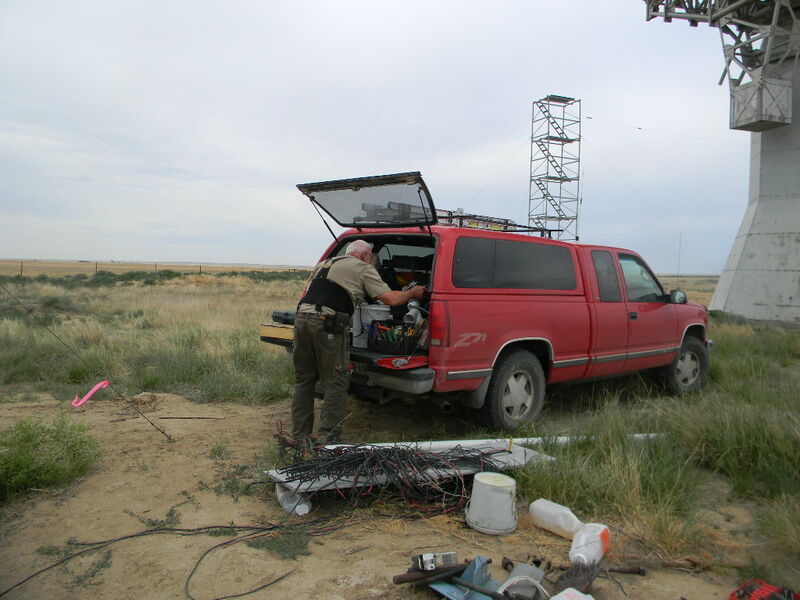 – Gary used Dave’s antenna analyzer to check the SWR across the ham bands for the 5-BTV vertical antenna we installed by the bunker. The results show that the 10 and 15 meter bands are tuned well. The 20 meter band is biased towards the low end, with 14.0 MHz at an SWR of 1.4 and 14.350 MHz at an SWR of 2.8. The 40 meter band is biased towards the high end, with 7.0 MHz at an SWR of 3.1, the minimum of SWR 1.5 at about 7.23 MHz, and 7.3 MHz at SWR 1.8. 80 meters is tuned to a best frequency of about 3.9 MHz (SWR = 1.8), with a probable usable range from 3.87 to 3.947 MHz (where the SWR reaches 3.0). Gary noticed one of the smaller radials for the vertical broke in the middle. Perhaps it had been set a little too tightly. – After checking with the analyzer Gary did some operating through the afternoon and evening on 10 through 40 meters, mostly on FT8 digital mode and some SSB on 10 meters. He was able to tune on the digital portion of all of those bands with his FT-950. During that time he made about a hundred contacts, which give the club some exposure to the ham community. As of this writing, about 50 confirmations were received on LOTW and eQSL. The QRZ page counter increased by about a hundred during that time as well. Propagation was poor, so that most contacts were just around the US. We did get some DX to Germany, Italy, and New Zealand. Gary also checked into the 12:30 pm Weather Net on 146.970 MHz on the Pikes Peak repeater, which is at a distance of over a hundred miles. – Dave Molter brought his trailer out and the crew loaded up most of the remaining surplus wood container parts for Dave to dispose of. – Tony Bigbee came out for the first time on Sunday. Bill gave him a tour of the facility and Tony went right to work, cleaned out the pedestal base room, and sorted out a lot of the surplus hardware there. Thanks Tony, this was greatly needed. – The Britain family from Haswell came out on Sunday afternoon. Bill, Paul, and Tony gave Mr. and Mrs. Britain and their two ~10 year old boys impromptu presentations and tours of parts of the facility. Mrs. Britain is a teacher and very interested in working with DSES on a school & student outreach program in the area. 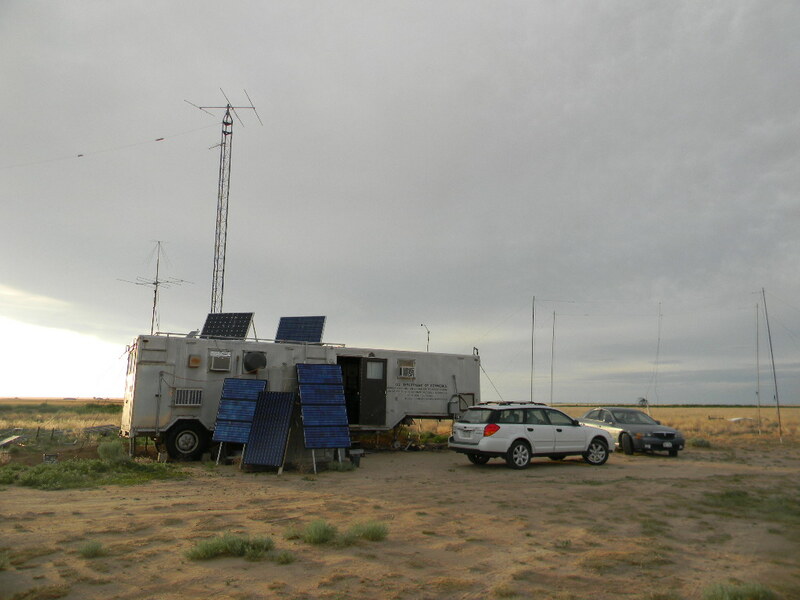 – Dave again tried the VHF talk-in radio system (on 146.46 MHz) while coming in to the site. 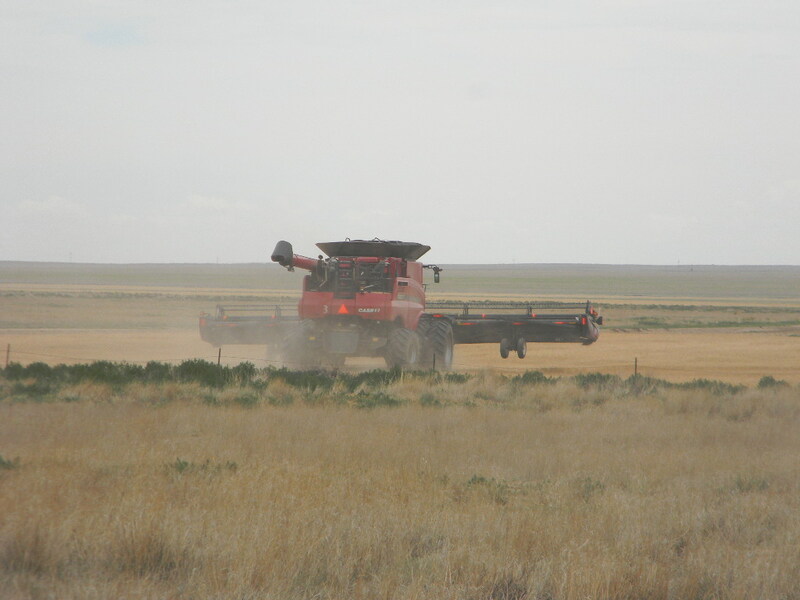 We had a clear contact with him from about mile marker 128 on Highway 96. 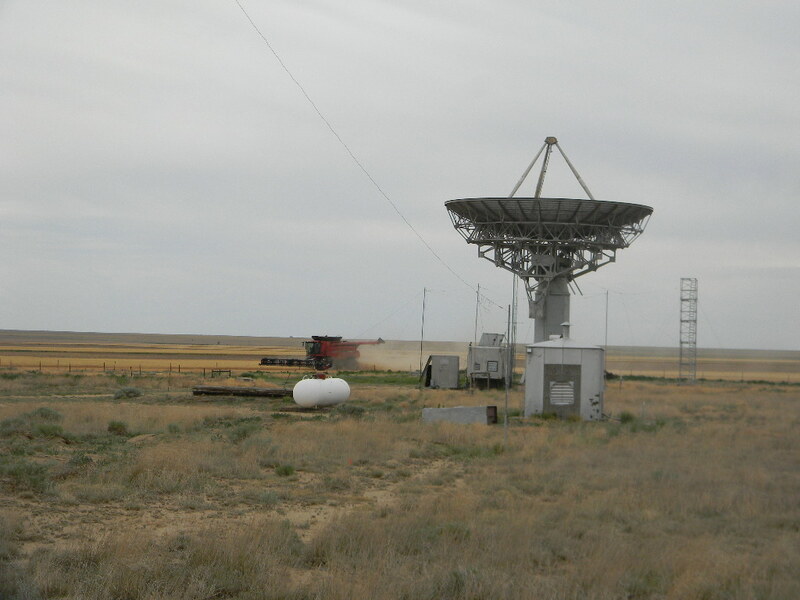 Gary tried communicating through the talk-in system coming from the south from Las Animas. 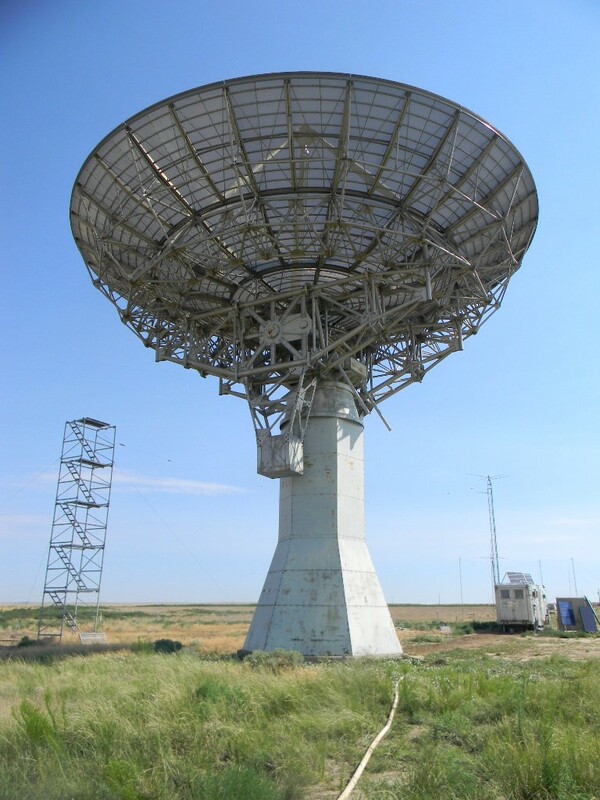 He contacted Ed and could be heard from the first transmission at the county line, which is on a ridge. 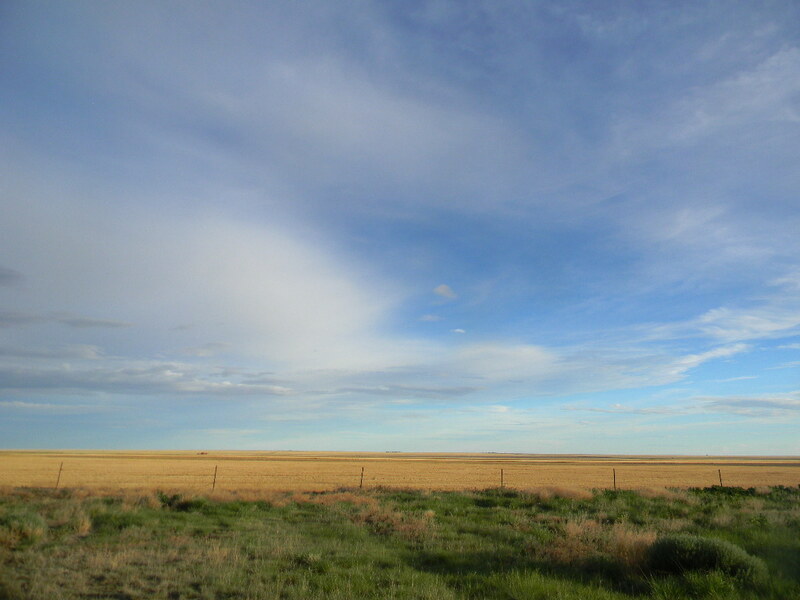 Gary again tried talking to the system with Bill while going out, traveling north to Haswell and then west on Highway 96 past mile marker 128. Gary could hear Bill clearly along most of the route, but Bill had some difficulty hearing Gary. Bill suspects the problem may be at the audio of the phone receiver in the comm. trailer. The team considered this a successful trip. 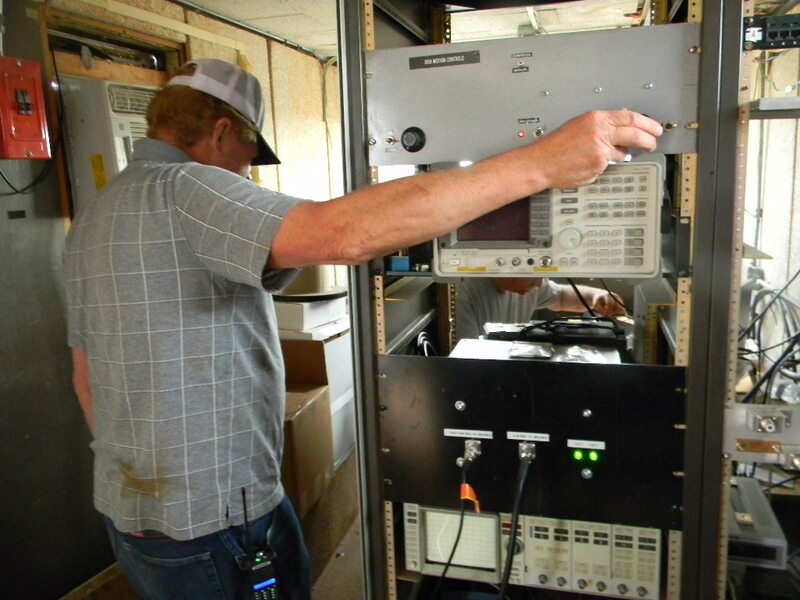 Gary using Dave’s antenna analyzer to record SWR (standing wave ratio) values on the 5-Band Trap Vertical antenna for the HF ham frequencies it covers. 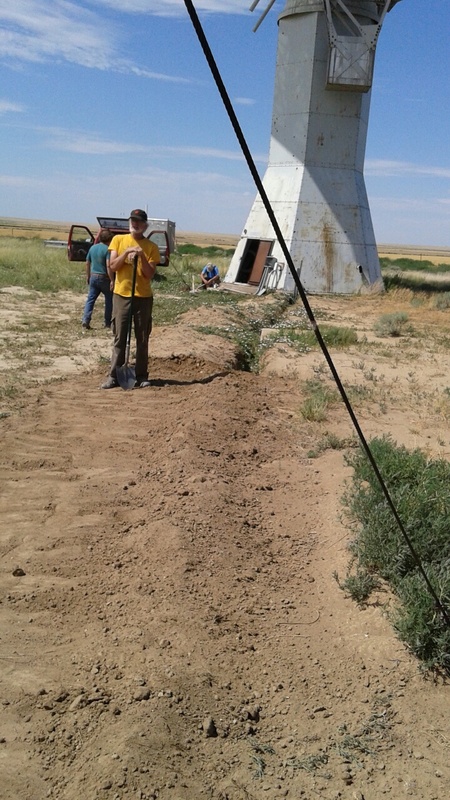 Paul and Steve worked on covering the synchro trench from the communications trailer to the pedestal. The synchro trench getting filled in. Ed installed wiring in a conduit to power the outhouse. This will eventually be covered over. Power conduit, looking back from the outhouse to the pedestal. The outhouse. Ed installed conduits and additional wiring at the left, which will power the RV risers. Dave loaded excess wood for disposal on his trailer Saturday evening. 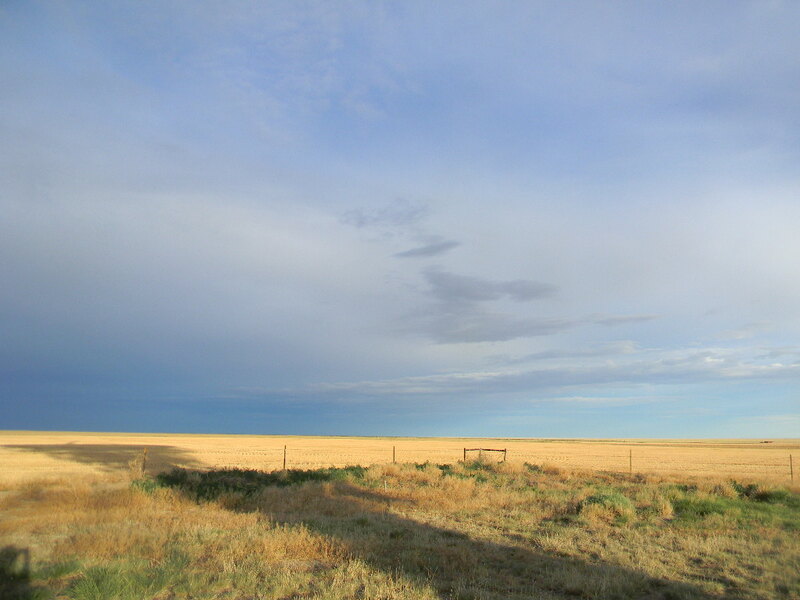 We watched a thunderstorm pass to the north. 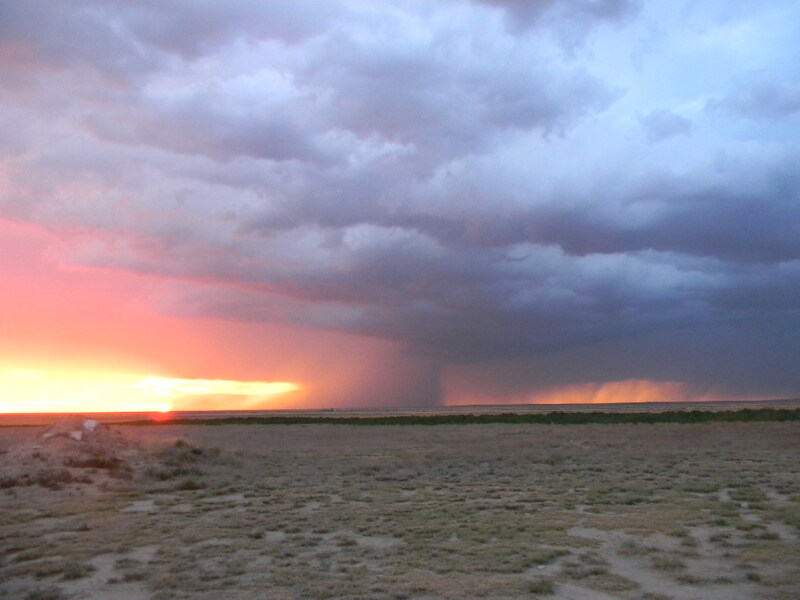 A passing storm at sunset Saturday evening. 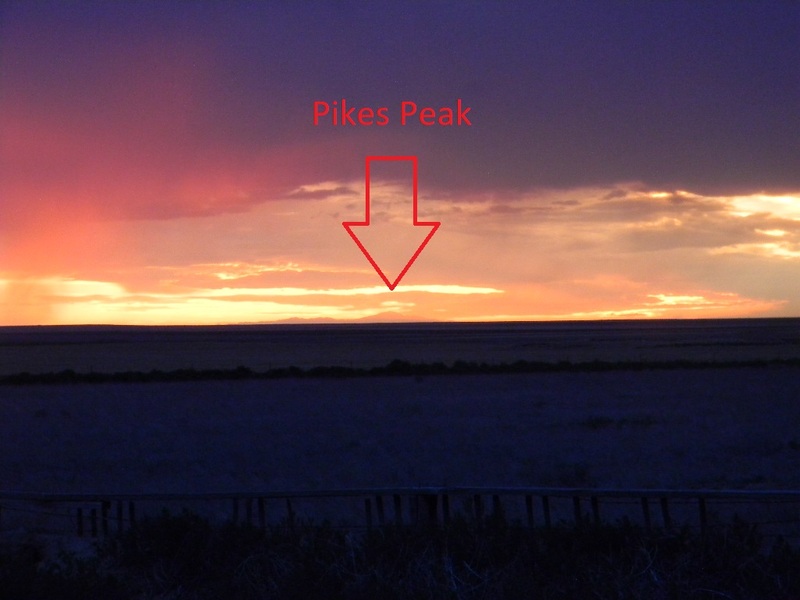 The rains seemed to clear the smoke and summer haze enough that we saw Pikes Peak in the distance. 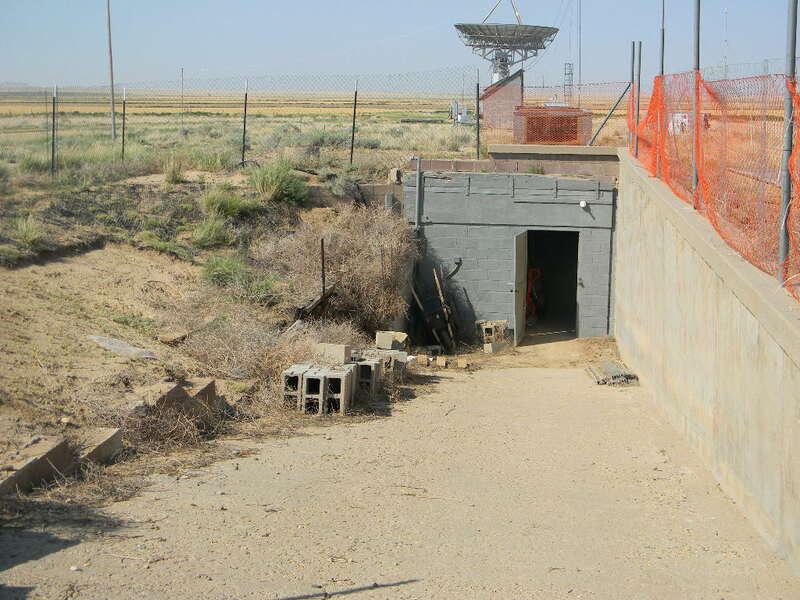 Dave also cleared out the tumbleweeds from the bunker ramp. 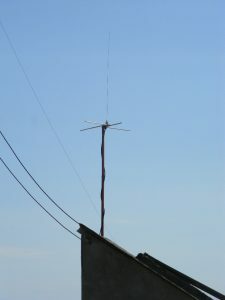 The antenna for the VHF talk-in radio, located on the “dog house”. The synchro indicator panel and the reinstalled the manual dish steering control panel in the rack, in the com trailer. Rear view of the synchro indicator panel and manual dish steering control panel. 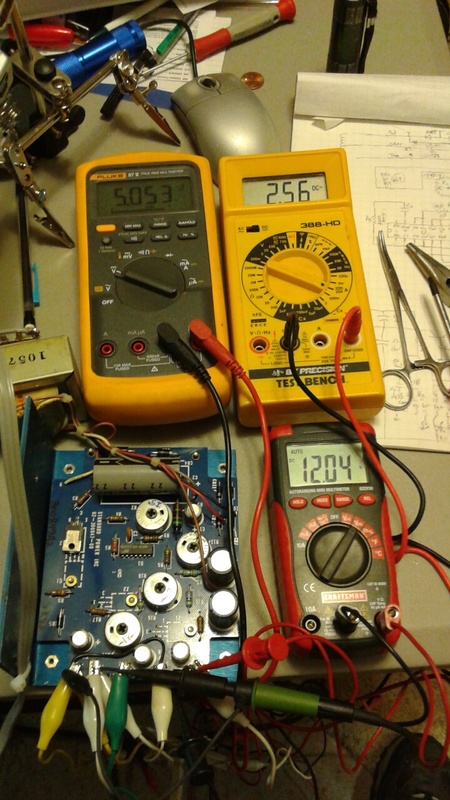 Bill’s test setup on the Analog Power supply for Dave’s System 1 controller. 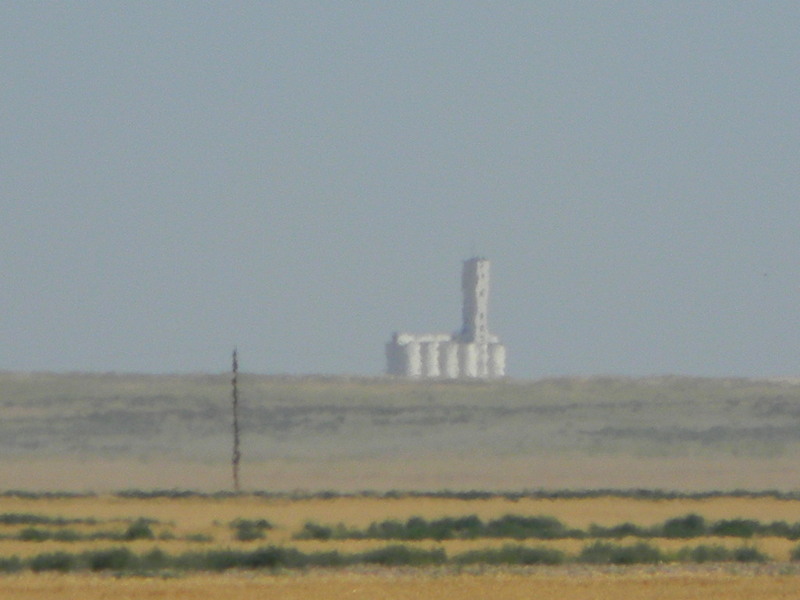 View of the grain tower in Haswell over 5 miles away, seen from the site. Steve’s antenna feed at the focus of the 60-foot dish antenna. Why is it done by so few? We do it for the FUN! To set the Cowboy in you free. This poem appeared in a guide to learn CW (Morse Code) by Ron Stark KU7Y, distributed by QRP Amateur Radio Club International. 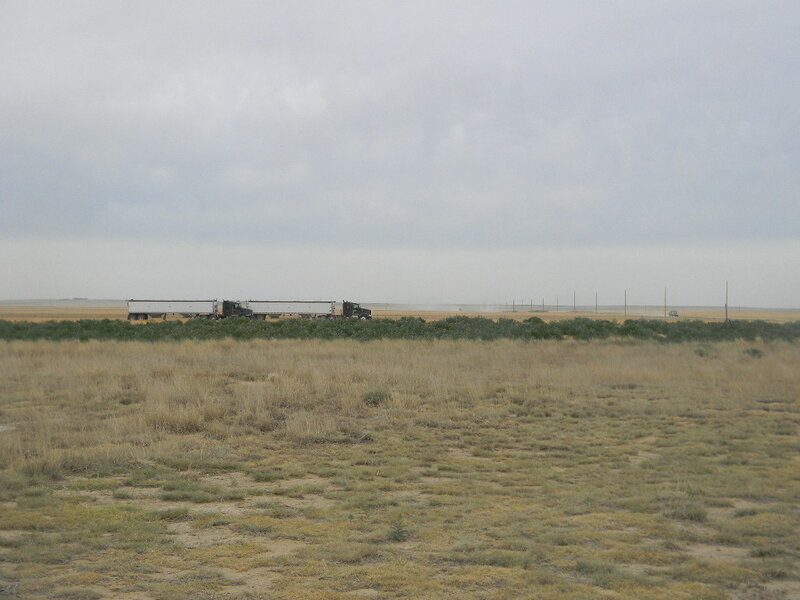 Trip report by Bill Miller, with editing and photos by Gary Agranat. 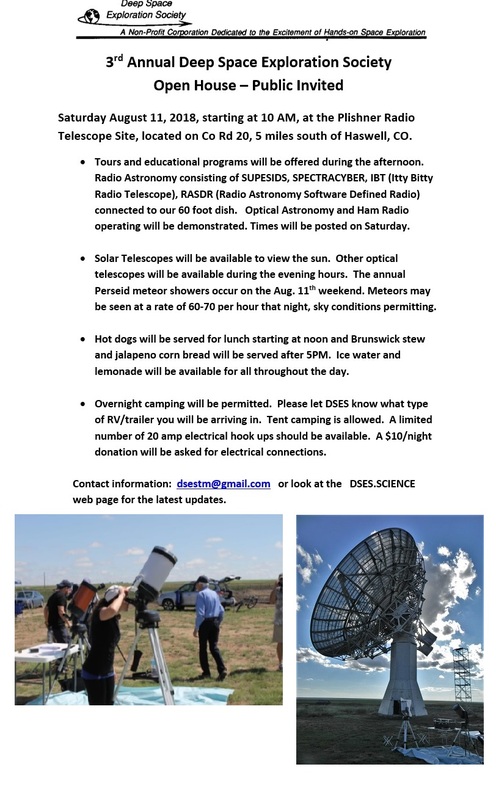 This is a report of our work at the Plishner radio telescope antenna site during the weekend of June 16 & 17, 2018. Attendance: Gary Agranat, Paul Berge, Ed Corn, Michael Lowe, Bill Miller, Dave Molter, Steve Plock. 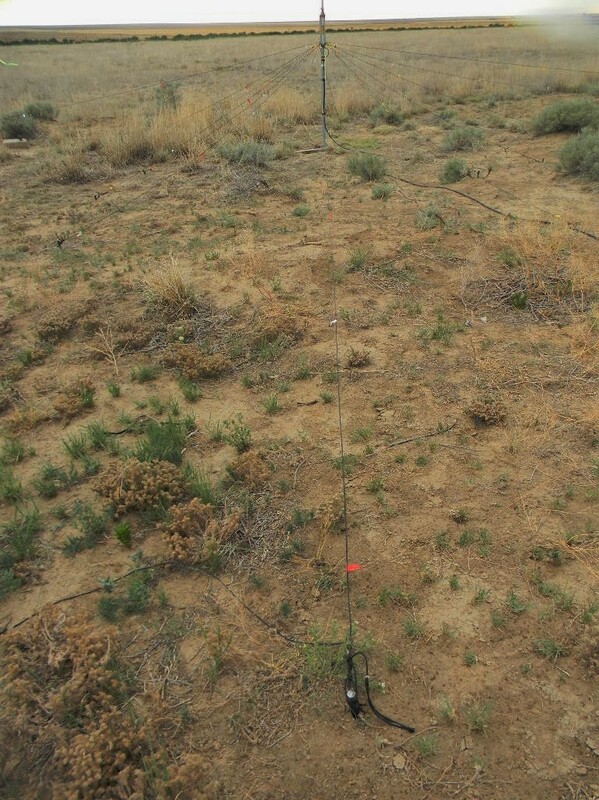 Vertical Multi-band Antenna Radials: Gary performed a set of SWR (Standing Wave Ratio) measurements with an antenna analyzer on the vertical multi-band antenna, which was installed last April for the ham radio station at the bunker. He then installed 17 radials at the antenna base. 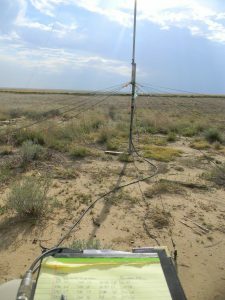 On the next trip he plans to retake antenna analyzer measurements, and also do some digital radio operating, to compare characteristics before the radials were installed. New Rest Room: Steve Plock and Ed Corn continued work on the new rest room/out house. This is a refit of one of the rail road buildings previously used for storage. They added tie down cables to prevent it from succumbing to the winds. 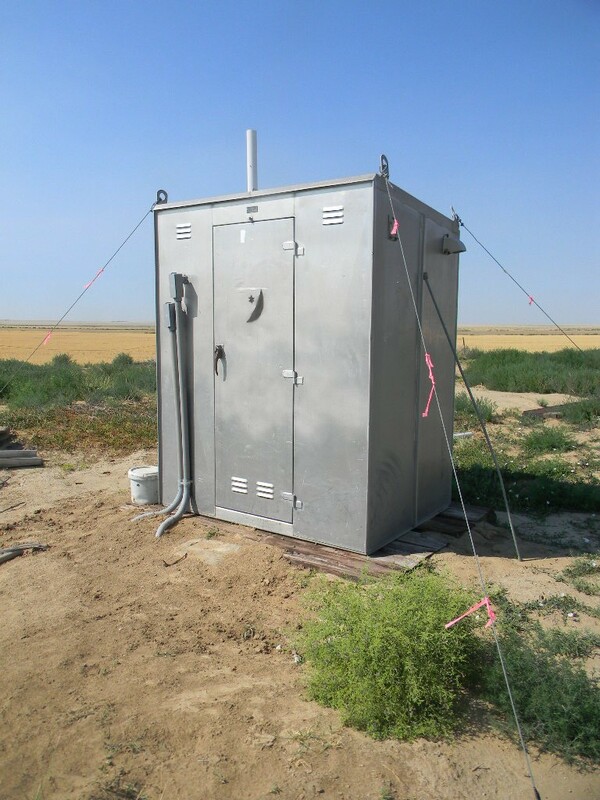 It will be fit with a chemical toilet and there is a waste receptacle behind the building for easy dumping access. This will greatly improve our facility for public visits such as the open house on August 11th. Synchro Installation: Bill worked on the dish Az/El Synchro installation as a simple backup pointing system for the dish. On the previous trip Bill and Steve installed an additional 2” conduit from the Comm Trailer to the pedestal. Myron had helped pull in the 15-conductor cable. On this trip Ed Corn helped finish off the conduit and drilled 2” access holes in the trailer floor and pedestal. 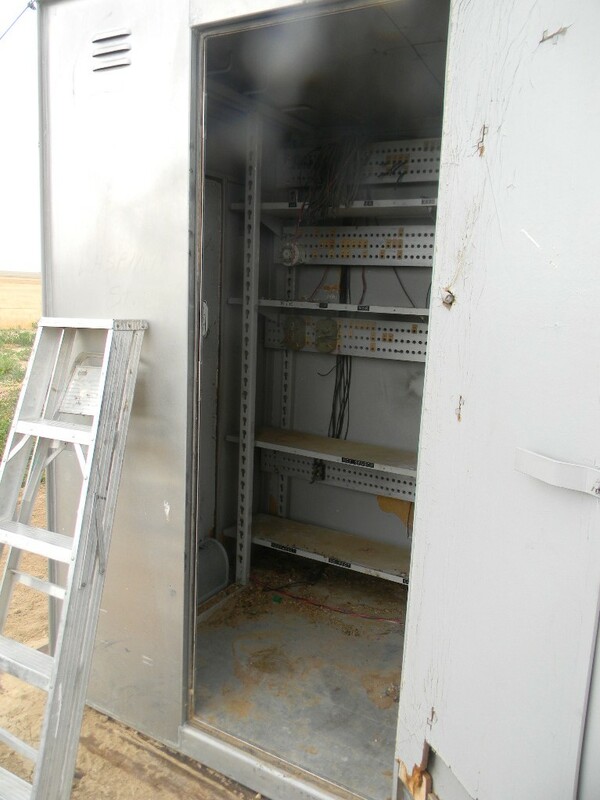 Bill installed the cable up the pedestal structure and terminated it in the terminal box above the control deck. He also terminated the other end on the synchro panel in the comm trailer. The azimuth synchros were hooked up and they worked. One problem remains with the fine azimuth synchro. 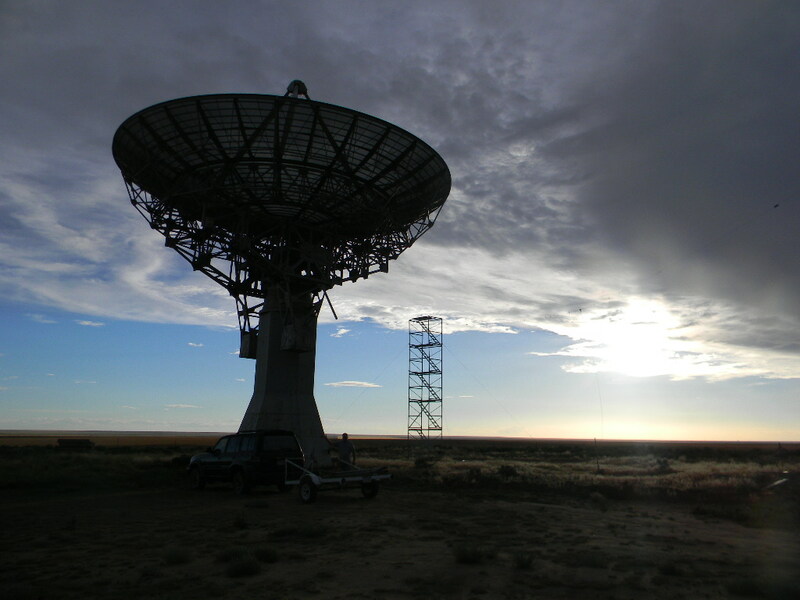 The Elevation synchro connection on the dish will be made in a future trip. Pointing System 1: Bill and Dave examined what would be needed to complete system 1. Bill has a linear power supply in the works to replace the noisy switcher. He also has an amplifier and watch dog circuit for the control function in progress. Dave suggested removing the system 1 box on the next trip and bring it back to Colorado Springs to install these and other software modifications for Glenn to test. Currently system 1 only has position feedback and no direct control. Pointing System 2: System 2 currently has all the circuitry for full position reporting and tracking control. As reported last time, Bill is working to transfer programs between computers and working on the system 1 at home and will reinstall on the next trip. Dish Restoration and Maintenance: Paul Berge came down Saturday afternoon and stayed for work Sunday. Paul checked our Synchro system and made some valuable suggestions. 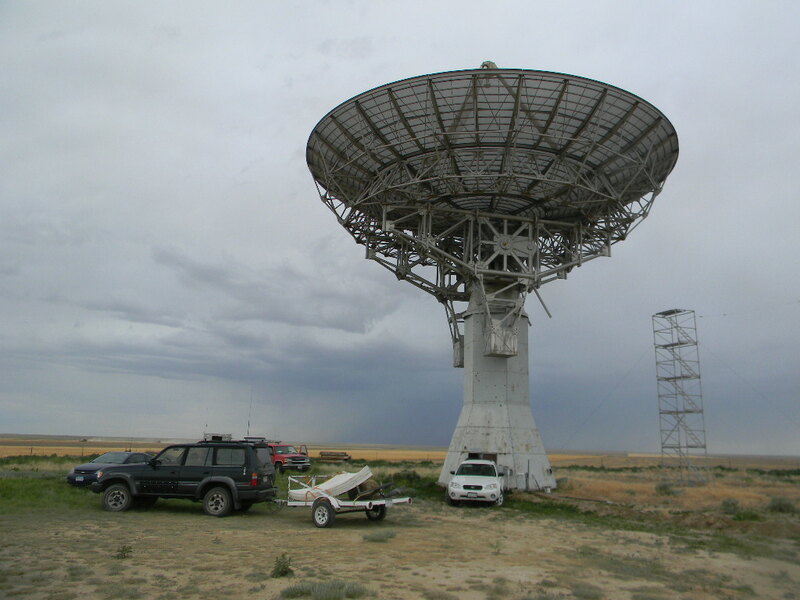 He worked on other maintenance items on the dish including making a rubber bellows and seal to keep the water and birds out of the multiple cables feeding down through the center of the azimuth axes. He also started working on wiring and setting up the Elevation and Azimuth limit switches. Other Items: Dave Molter finished the tear out of the 12-foot fiberglass dish and support concrete from Sue’s yard in Sugar City. 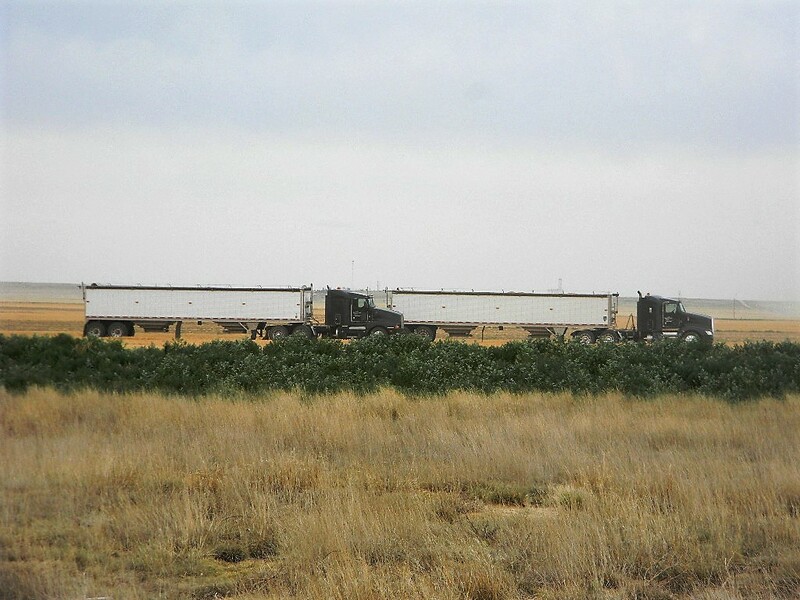 He transported it down to the site on his trailer and unloaded it for future use. 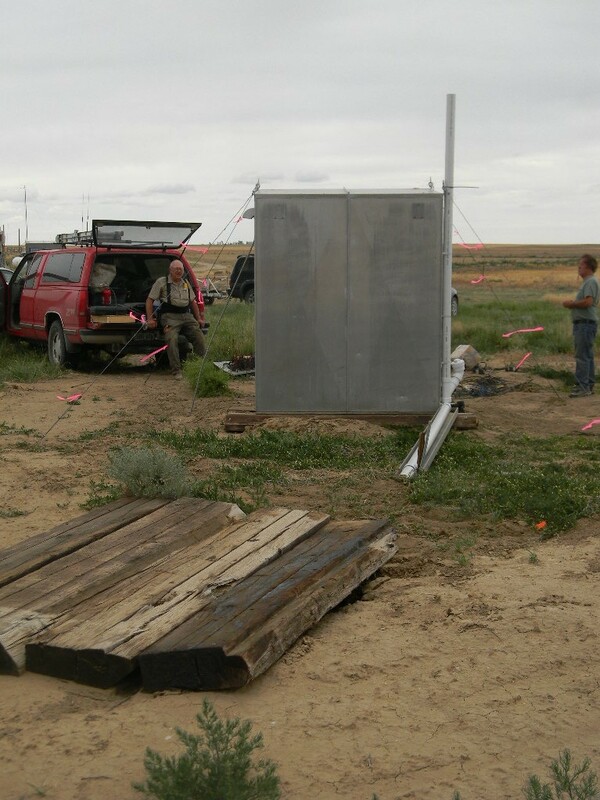 Bill and Dave pulled a vertical antenna and base insulator out of the pedestal and loaded it on Dave’s trailer. 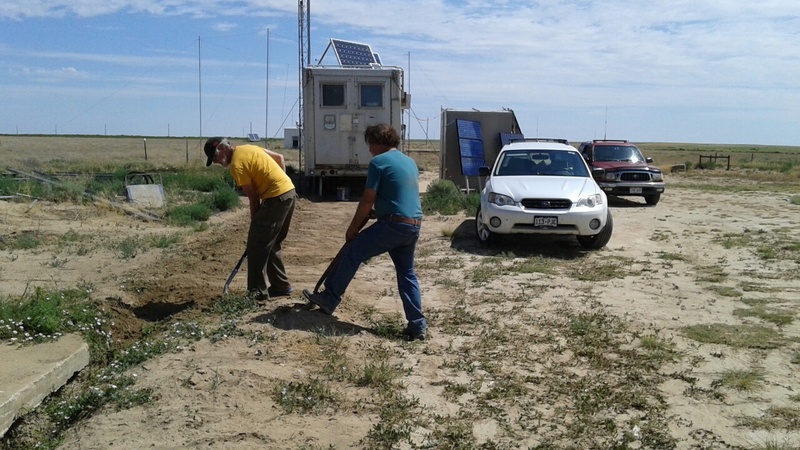 Dave returned the antenna to Michael Lowe in Pueblo who originally brought it to the site. 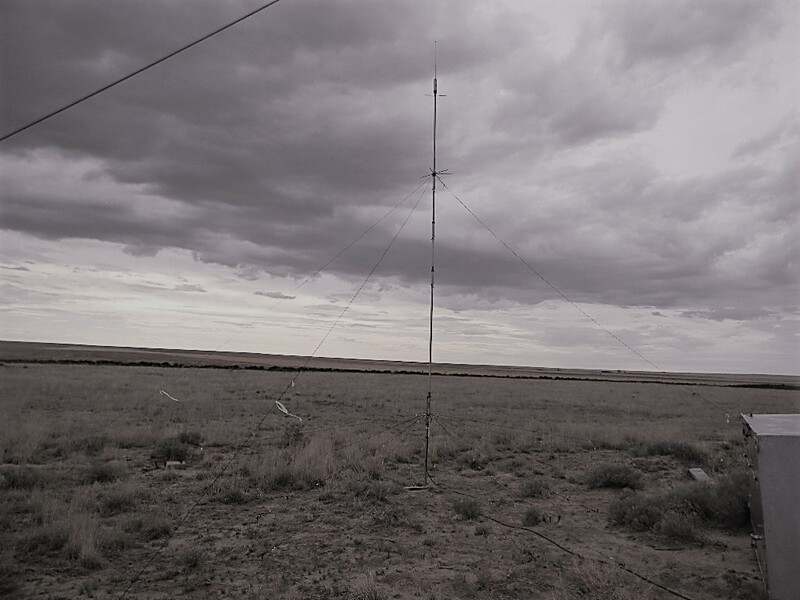 The vertical 5-band antenna for the bunker ham radio station, with the radials installed. Close-up of the radials for the vertical ham antenna. The rest room after securing with guy wires. Ed Corn preparing to install PVC drainage pipe at the new rest room. The rest room with the drainage pipe installed. The rest room with the drainage pipe installed. The effluent and chemical will drain to this excavated hole, which is now covered by railroad ties for safety. With Ed Corn and Steve Plock. Inside the rest room, a repurposed railroad shed, after it was cleared out. 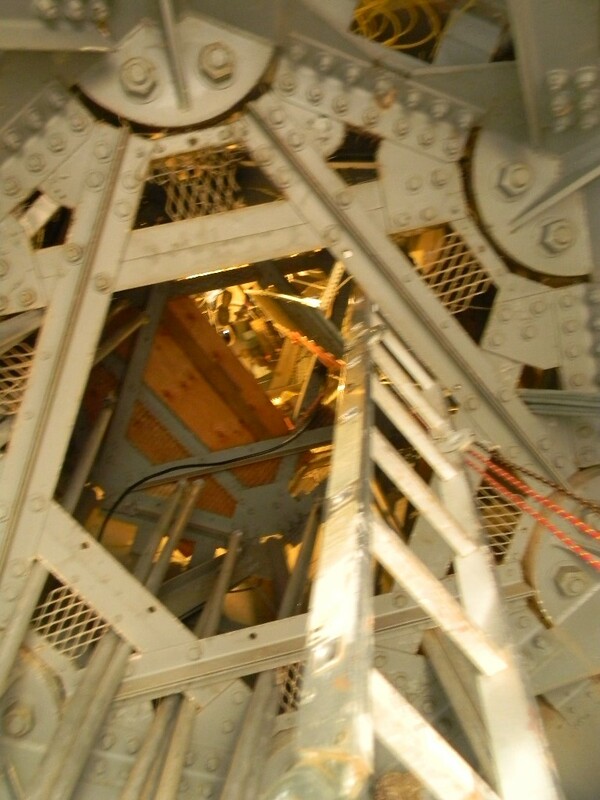 Looking up, inside from the base of the pedestal, to the third working level. Bill Miller showing the terminal box at the third level of the pedestal. Bill Miller with another junction at the third level of the pedestal. Dave Molter bringing the pieces of the 12 foot satellite dish from Sugar City. 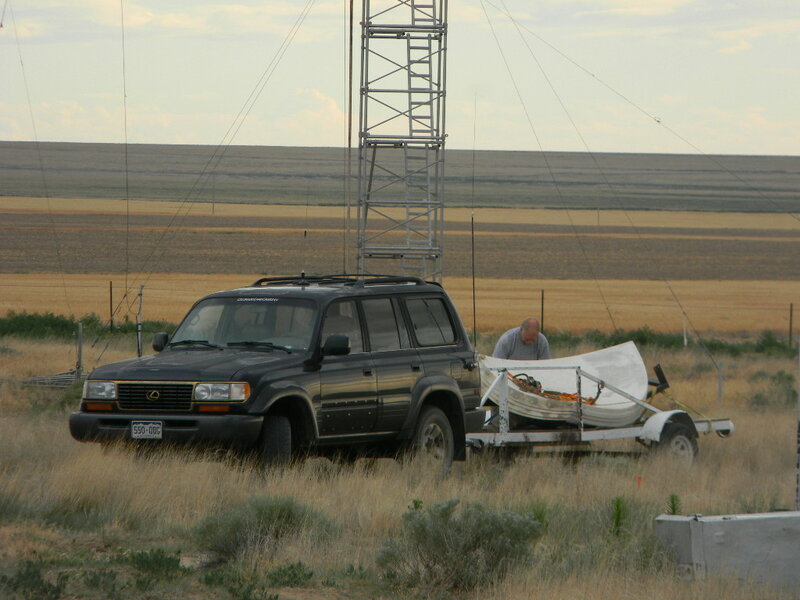 Bill Miller manually steering the 60-foot dish antenna, while Dave Molter monitors the position feedback. Bill Miller manually steering the 60-foot dish antenna, while Dave Molter monitors the position feedback on the synchro panel. Close-up of the synchro panel. 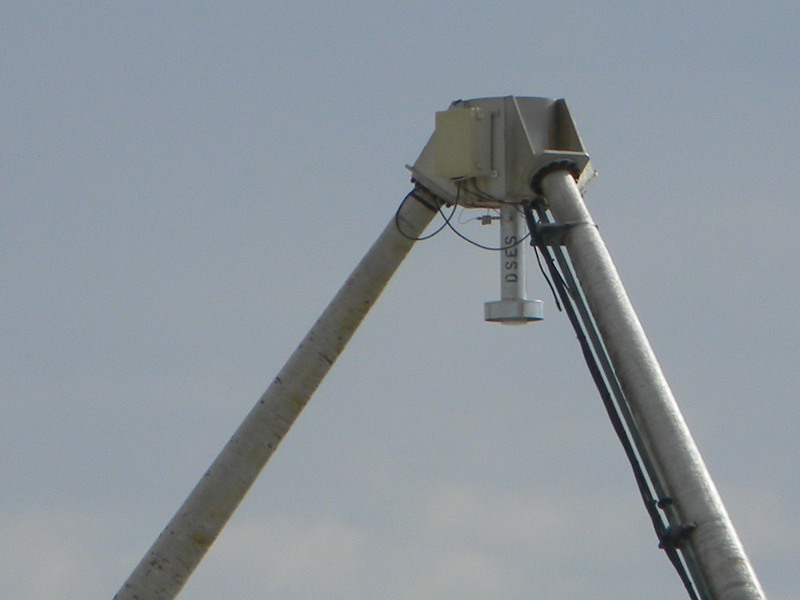 It is designed to show the course & fine positions of the antenna elevation and azimuth. 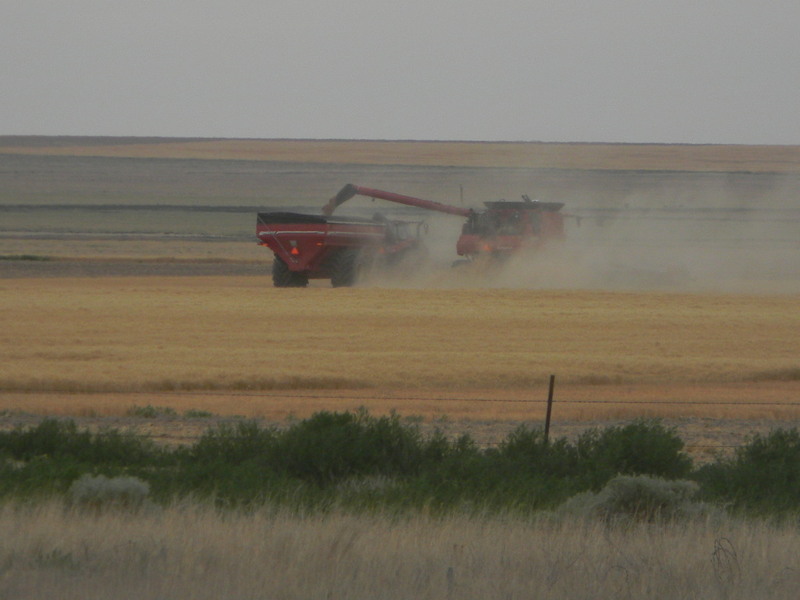 While we worked on Saturday, there was harvesting in the surrounding fields. 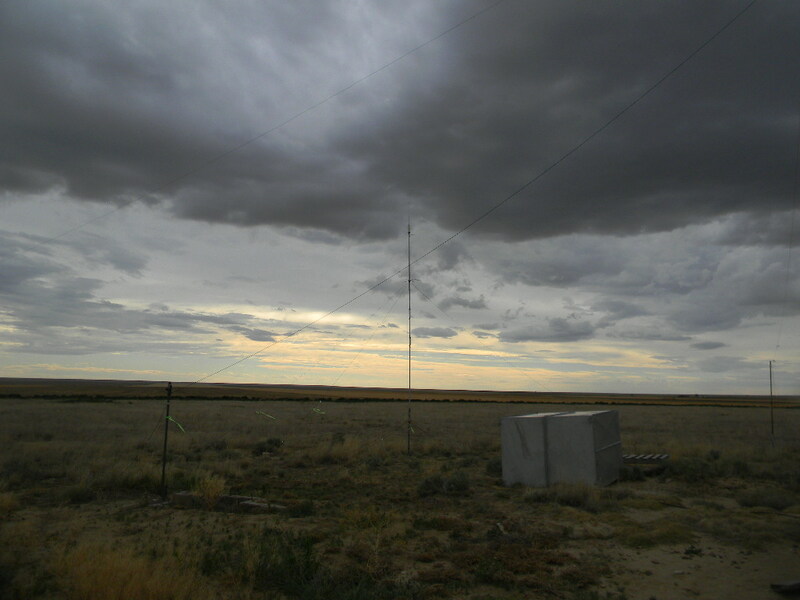 The vertical ham antenna by the bunker, at the end of the work day Saturday. Some rain passed through during the late afternoon Saturday.